At 3B Scientific - Medical Education, they believe that trained professionals with a higher level of knowledge and skills will minimize treatment errors when caring for patients. Health education - You will find high quality and functional products to educate about common health risks and diseases. Their specialty merchandise is ideal for educating patients and for student training. Human anatomical models - 3B Scientific's anatomical medical models provide the perfect vehicle to study and explain the internal and external structures of the human body. Whether your lessons involve an anatomical skull model, 3D models, anatomical muscle models or an anatomical heart model, you'll find the most detailed brain models, dental, digestive, eye, pelvis, joint models and the list goes on. Human skeletons - Why did the skeleton cross the road? To meet his skeleton buddies over at 3B Scientific! Study the skeletal system and individual human bones with disarticulated skeletons, bone models or a human anatomical chart. Choose from human skeletons in half or full models that feature either loose or rigid mounted hands and feet, complete legs and arms, from Classic Skeleton Stan to Super Skeleton Max with over 600 hand painted items of medical interest! Human anatomical chart - Find the best anatomical charts in the biological business with human anatomical charts from 3B Scientific - Medical Education that are poster sized, graphically illustrated, expertly written and printed on high-quality photographic paper! Choose an anatomical body chart that focuses on the human skeleton and musculature or a chart detailing the eyes, ears, heart, lungs, nerves, diseases and more! Human Torso models - Featuring full-sized, half-sized and desktop torsos for high school and medical schools, 3B Scientific's human anatomical torso models come in dozens of configurations and levels of detail to meet any budget. Choose from extraordinary designs of male or female torsos that include anywhere from 12 to over 30 removable anatomical parts! 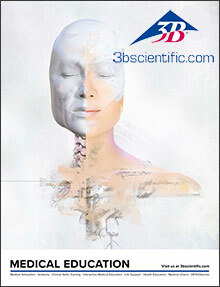 View thousands of anatomical supplies and items in the 3B Scientific - Medical Education catalog. Besides their durable selection of human anatomical models, skeletons and torsos, you'll find human anatomical charts and pharma posters, skulls, mini-skeletons and more products to help your students master their Gray's Anatomy.